I had previously reviewed the freshman release by Silveroot Full Measure and was truly refreshed with the wonderfully uplifting sound the CD offered. 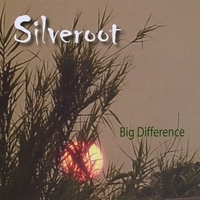 Silveroot has certainly measured up and surpassed the last recorder with their new offering Big Difference. Silveroot still offers the same great lyrical content and masterful musicianship, this time there is just more of it to offer. The group now consists of Patrick Flynn (guitar/vocals/bass/drums/mandolin/harmonica), Darryl Webb (banjo/accordion/vocals/guitar/bombarde/banjotronics), Emily Palen (violin/vocal), Mardell Mardequx (violin) Ilaya (vocal). “Big Difference” starts the adventure on the CD with a big E minor chord and beautiful violin soaring over the minor progression. Patrick Flynn’s earthy voice tells a story about respecting the little things in ourselves and others and if we do, it will make a big difference. Flynn obviously keeps this rule when writing his music. The storyline is well thought-out and the harmony parts of Flynn and Darryl Webb are creative and well thought-out, and truly do make a big difference. “Rest Stop” makes a stop in the parking lot of country blues with Flynn’s rich guitar tones and rhythms. Emily Palen’s violin playing is tasteful and always adds just the right musical touch. The bluesy line that she plays with Flynn’s guitar really adds to the texture of the song. Again, Flynn’s reflective lyrics are telling and always keep the listener wanting to know where the next phrase will lead them in the musical story. We get another taste of the blues influence with “Benefit of The Doubt.” This blues shuffle in G finds Flynn’s gravelly voice telling a story of life’s little questions. Again, Palen’s violin play’s on the mark and Flynn’s swinging blues harmonica is straight from the heart of the blues, nothing to complex here, just great playing, singing, and a well written story (again with a morel to the story, Flynn’s own unique styling). Big Difference is a great title, but thankfully the only real big difference is more great tunes, more wonderful performances and more Silveroot. Listener’s that were already fans of Silveroot won’t be turned off by this Big Difference they will just have more to love. An excellent follow up to Full Measure and worth every moment, I didn’t review my favorite cut “Home Cookin,” because there was no explanation necessary, it is just one of the best single cuts I have heard in ages, and if you as the listener does not find this a toe tapping, fun loving cut …well we might have to set up an appointment to have your smile meter checked.